The Yamaha DMR8, (see picture (01), is a 24 track digital mixer with a built in 8 track recorder, SPX1000 type effects, SMPTE and various AES and analogue I/Os. 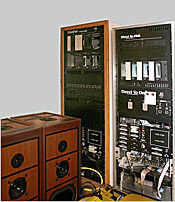 Ideally this unit should be used with the two DRU8 units, (seen in picture (02), together with the AD8X A to D units, (also seen in picture (02). This would give the user 24 tracks of digital recording. There is also a DMP7D Digital Mixer, (see picture (03) and together with the extra AD8X would give the user 32 ins and outs. This set up also has a RC24 remote control unit. The build quality is superb, better than the current Yamaha offerings and the overall condition of all the units is mint. I think this set up would suit a musician that requires 32 tracks of dedicated monitoring and the price I'm asking for the whole rig is very good value. The New England DTD Post Pro (see picture (04), unit on far left) used to belong to Disney in Florida, basically it ran the show. 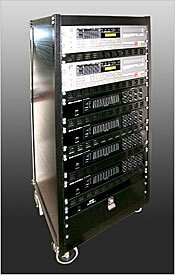 It is a 16 track recorder with 16 I/O, AES/EBU I/O, SMPTE, Click 4 drives with DAT B/U and Apogee filters. 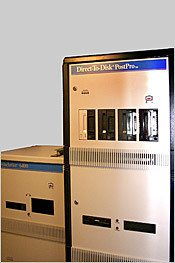 The Synclavier Company DTD Post Pro, (see picture (05), has the same spec as the 'Disney' but has a studio enclosure. The Sony Umatic, (see picture (08), has recently been serviced and is 100% reliable, it is in mint condition.